Thanks to everyone that participated in the Battlefield 3 Open Beta, especially those that contributed their feedback and ideas. 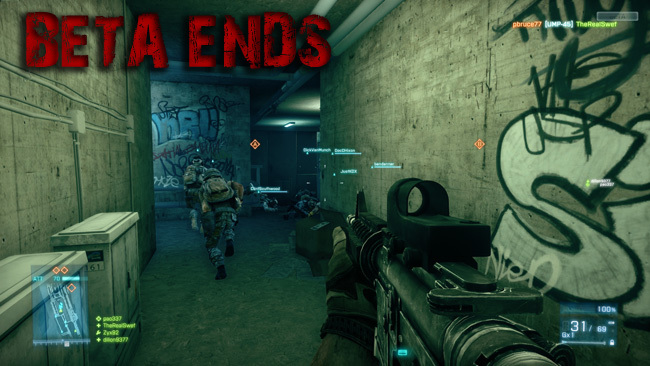 Your input has helped to make the final release of Battlefield 3 all the better. Like all good things, though, so too must the Beta come to an end. We’ve got to get the servers down, make updates and tweaks based upon all the feedback you’ve given us, and get everything ready for the big day of release. Thanks again to everyone who participated – we’ll see you on the Battlefield. En otro post dejaron claro que están trabajando en los principales “bugs” que se presentaron en el beta, enfatizando en 10 de estos y que pertenecen a todas las plataformas, no sólo los de PC. Y bueno, con esto llega a su fin el periodo de prueba y sólo nos queda esperar que el producto final llegue o supere nuestras expectativas.